The lucky three winners will get a free Annual Membership Account at PixelKit. They have literally thousands of graphics available, so they are the best solution for web designers. 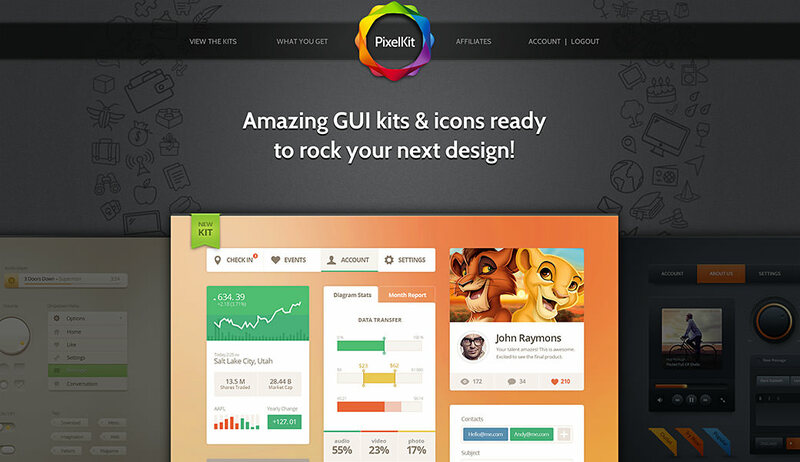 PixelKit is actually specialised 100% for UI kits. That means you’ll get everything you’ll need as far as app screens, navigation controls and more. Take a look at all we have available and you’ll discover more sliders, buttons, icons and other design elements than you might ever need. This is a one week competition and will be running until the next 23th. If you’re ready to enter, how will you get a voucher? Just leave a comment at the end of this post or telling us just why you should be a winner, and where you‘ll use your free Annual Subscription for PixelKit premium graphics if they choose you. We think this free subscription is very enticing, since you’ll save time, energy and hassle when you use PixelKit. You’ll get the highest quality in UI kits and you’ll get them right away. So you can finish each project more quickly, take on more projects and make more money! Our icon set in vector outline is the perfect match for your flat or metro app or website. This stats infographic kit allows you to use easily understood visual representations to present complex information easily and clearly. This UI kit is easily read and works great for pastry, bistro or coffee shop websites. This flashy flat icon set makes your mobile app or website shine, without a doubt. It is best used with a website that has a modern flat, metro feel and look. This UI kit will help your website to stand out, with its playful, fresh look. It includes more than 100 vector elements, so you’ll have everything you’ll need for creating cohesive web designs.